This delightful Danish label creates beautiful toys designed to inspire little one’s imaginations. In a world of constant noise and distractions, Maileg is all about slowing down and getting lost in a world of wonder. In the Maileg kingdom, cats and rabbits live alongside each other, bunnies take ballet lessons, and matchboxes and cardboard boxes become beds and rooms for little mice. 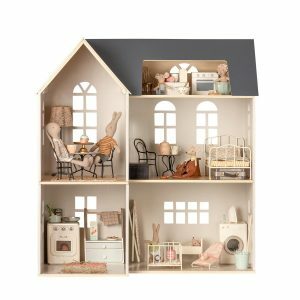 Exclusive Maileg wooden dollhouse. Perfect for mice, bunnies and all your Maileg friends. Personalise with your favorite Maileg furniture. Off white bed pictured is a miniature size bed. The only doll house guaranteed to fit most of your Maileg pieces. Comes flat packed and is easy to assemble. This is a preorder item with an expected arrival of August 2019. Little Maileg companions need to do their washing too. After all, so much play and fun always leads to dirty clothes that could use a spin in the machine. It’s lucky then that Maileg has created a wonderful toy washing machine that’s perfect for cute and cuddly friends. Measuring approximately 14.5cm, this small yet sturdy machine is just the right size for Maileg’s Mini Rabbits, Mini Bunnies and Best Friends Range. 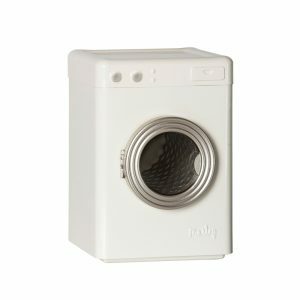 Made from metal, the Maileg Washing Machine looks and feels just like the real thing (only so much sweeter thanks to its small size). As such, it makes the perfect addition to a doll’s house or make-believe home for soft toys and other mini pals. Ideal for encouraging imaginative play, the Maileg Metal Washing Machine will help bring your little one’s favourite toys to life. As your little one rests their head, Maileg Tooth Fairy Mouse will quietly take their lost baby teeth and store them in her backpack. In the morning, where once was a tooth, your child will now find a special treat or gift left behind by this lovely mouse. That’s not all this tooth fairy’s job entails, though. With her trusty wand in hand, he also spreads plenty of magic and helps ensure that your little one has the sweetest dreams. After a hard night of work, Tooth Fairy Mouse naturally needs somewhere soft and comfortable to sleep. Luckily, he is a small size (measuring approximately 12.7cm) and has his very own beautifully coloured matchbox where he can rest his little head and get some shut-eye. 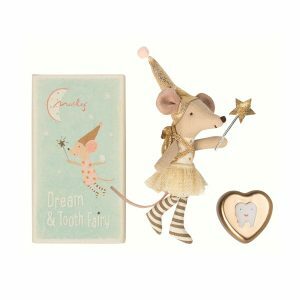 Whether off collecting baby teeth or fast asleep in her box, this charming soft companion wears a starry suit with striped leggings and a glittering hat. As your little one rests their head, Maileg Tooth Fairy Mouse will quietly take their lost baby teeth and store them in her backpack. In the morning, where once was a tooth, your child will now find a special treat or gift left behind by this lovely mouse. That’s not all this tooth fairy’s job entails, though. With her trusty wand in hand, she also spreads plenty of magic and helps ensure that your little one has the sweetest dreams. After a hard night of work, Tooth Fairy Mouse naturally needs somewhere soft and comfortable to sleep. Luckily, she is a small size (measuring approximately 12.7cm) and has her very own beautifully coloured matchbox where she can rest her little head and get some shut-eye. Whether off collecting baby teeth or fast asleep in her box, this charming soft companion wears a gorgeous tutu with striped leggings, a starry top, and a glittering hat. Maileg's adorable Little Brother Mouse is sturdily made from cotton with a sweet embroidered face, big ears and a tiny leather tail and comes complete with a matching match box filled with colourful bedding. The match box is decorated with whimsical illustration and made with sturdy card board along with a set of bedding for sweet dream. 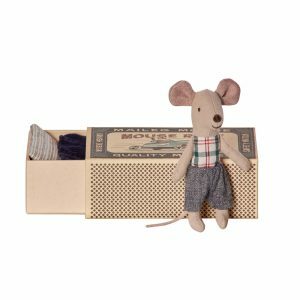 Maileg’s Little Brother Mouse in a Box makes for a lovely gift as well as a great start to your child’s own Maileg collection. This classic, timeless doll is sure to be treasured for a forever. Little Brother Mouse measures approximately 10cm. Match box bed measures approximately 11cm x 8cm. 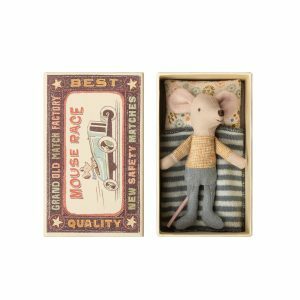 Your little one will love singing Little Brother Mouse to sleep as he lays down to rest in his matchbox bed. After a long day spent playing and having fun, there’s nowhere else this tired little mouse would rather be. Lovingly made from cotton, Maileg Little Brother Mouse is cute, cuddly and soft. He features a sweet and smiling, embroidered face with large ears and a little leather tail. He also has his very own matchbox bed, which is complete with colourful and cosy bedding on which he sleeps. 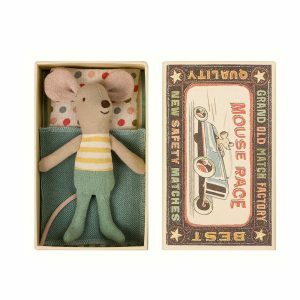 The matchbox itself is just as sweet and charming as Little Brother Mouse himself. 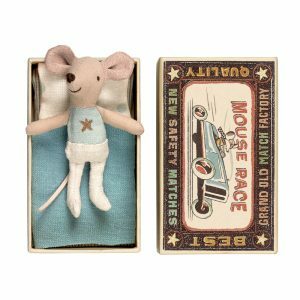 It features whimsical decorations and a beautiful illustration of a mouse driving a racing car. 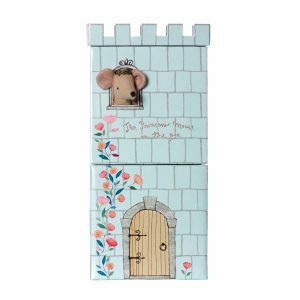 The perfect size for his little box bed, which measures approximately 11cm x 8cm, this Maileg mouse stands a sweet 10cm tall. He makes a lovely gift or addition to your child’s Maileg collection. Maileg Ballet School Studio is perfect for your Maileg friends to practice their favorite ballet moves in! 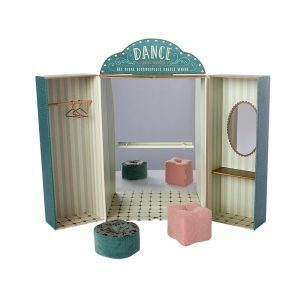 Maileg Ballet School Studio is a beautifully decorated cardboard case opens to a dreamy dance studio fully equipped with a bar, mirrored wall, bench, 2 cushion, and little gold hangers. * Dolls pictured are not included. 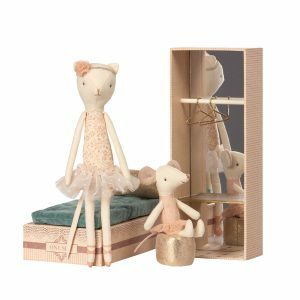 Maileg Dancing Cat and Mouse are best friends and practising ballet to dance with you! They come in a shoe box that equipped with all they need to dance practice and get ready for performance - A gold cushion, blue velvet mattress, 2 gold hangers, mirror, bar, and bench. The cat and mouse wear their tutus and are ready to perform. Doll's hands have hidden magnet to hold the ballet bar or holding hand of each other. Bottom part of the shoebox ( side with mirror ) can be used for ballet practice with bar or flipped for vanity table. The original tale of the Princess and the Pea gets a Maileg makeover with this charming toy. A cute spin on the traditional story, Maileg Mouse and the Pea is a fun and whimsical way to get your child interested in this classic fairytale. This magical toy set comes with a sweet little Princess Mouse, who wears a gorgeous crown and lovely dress, and her impressive castle. This wonderful castle features a beautiful and colourful design with a cute little window. Designed to easily slide open or closed, the castle, which is also a box, contains many wonders. Inside, your child will find the princess’s special bed, complete with multiple soft and cosy mattresses. However, no matter how many mattresses she has, Princess Mouse can always feel that small green pea lying under her bed. Perhaps your little one can help her find and remove it so that she can get some good shut-eye? Both you and your child will sleep better knowing that there’s a sweet little angel in their bedroom. 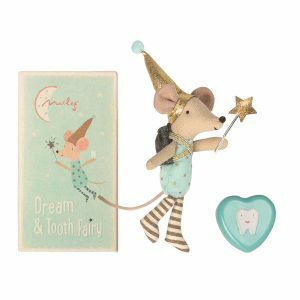 Perfect for watching over your little one day and night, the Maileg Big Sister Angel Mouse is always there for your child whether they’re playing or dreaming. 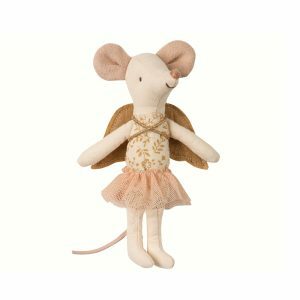 From her beautiful and smiling embroidered face to her golden wings, this mouse angel is as cute as she is caring. Standing at approximately 13cm tall, she also features large rosy ears and a charming, little leather tail and wears a lovely tutu. Carefully crafted from cotton for a soft and sturdy finish, Big Sister Angel Mouse is cosy and ready for cuddles at any time. Of course, she also loves playtime and enjoys taking part in fun adventures.